Look at you, my big girl! You are officially no longer considered an "infant" (at least, I don't think so). This month you really got to feeling much better...back to the [6-month] version of your "old self." You started sleeping through the night again, all the way...by the end of the month from about 7-7. And you are ASLEEP at 7 p.m. When you're ready to go to sleep, you make it adorably obvious by rubbing the heck out of your little eyes. And you do not want to fall asleep in our arms or couch or any of that. You want to be wrapped up in your own bed. Cutie pie. We started solid foods this month. I weaned you from that post-hospital middle-of-the-night feeding, but you wouldn't take in any more oz. during the day...you were still waking up a little early ready to eat, so we tried some rice cereal. You didn't love it at first...way more interested in the spoon than the food. But then you got pretty into it (not the rice cereal necessarily, but eating in general). So far, you've HATED avocado and peas and you LOVE (and I mean LOVE) bananas and sweet potatoes. You don't realize this now, little missy, but it takes a lot for Mommy to feed you bananas, as they are probably the only food in this world she refuses to eat. Only for you! We also gave you a sippy cup (with water) this month for the first time. You still haven't quite figured it out, but you are definitely interested in it, as you are in ALL cups around you. Mommy has to watch herself while holding you and trying to take a sip of something. You also moved up to 8 oz. bottles of milk during the day, and can go 4 hours in between (sort of; see below). You nurse around 7 am, have bottles around 11 and 3; then when Mommy gets home from work, that's when our 1.5 hour "feeding frenzy" starts. You nurse around 5:30, eat solids around 6-6:15, take your bath, and then nurse AGAIN before going to sleep at 7. It's quite impressive. You've gotten into a better nap routine too, usually about 1-1.5 hrs in the morning and 2-3 hours in the afternoon. You love being in your bed! After you are swaddled up (yes, still) and get your paci, you turn your head as far to the left as you can, signaling, "Ok, that's all I needed, you may go now!" It's pretty funny. 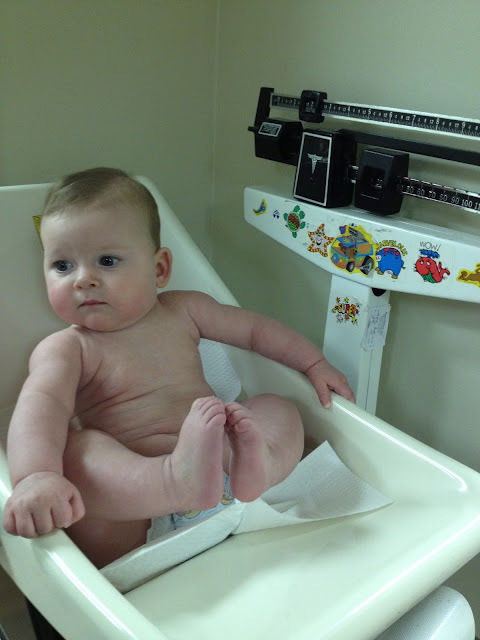 At your 6 month check-up, you weighed in at 17 lb 6 oz (75th percentile), and were 27.5" long (95th-97th percentile). You head circumference was still at 50th (can't remember the inches)...the same % from your 4 month check-up! Still our [miniature] tall drink of water! We just cannot get enough of your sweet expressions, your babblings, your INTEREST in everything around you...it's all so fascinating and wonderful to watch. You wear 6-9/6-12 m clothes, and still size 3 diapers. No teeth yet, although Dr. Bubba said your bottom gums were "thickening"...you still love to put everything in your mouth, and will have a finger, hand, shirt, blanket, toy, whatever lodged in there if not a paci. You're still loving your paci at bedtime, and also just when hanging out awake sometimes (but you don't really have to have it when awake). Your little hair has grown on top so much, and I can even put a tiny little bow in it! The "trick" you've perfected this month is rolling from back to front. 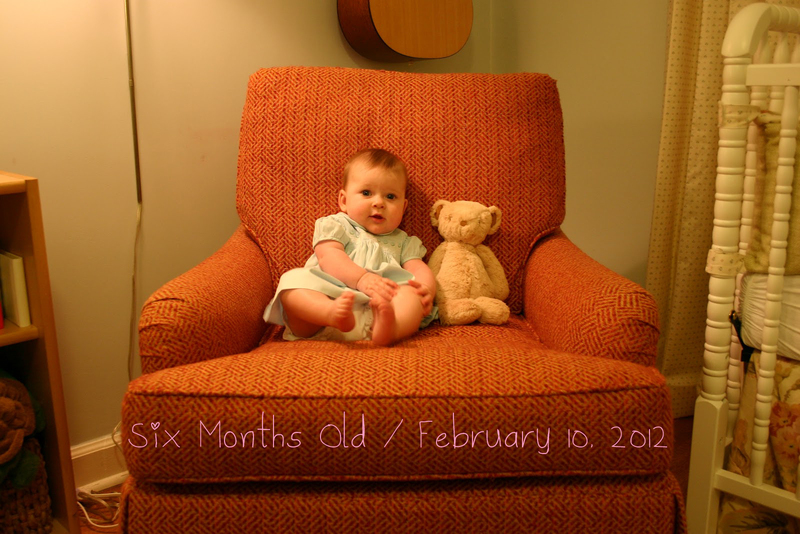 Right after turning 5 months, for a week or two, you'd get so so close and not be able to get your other arm up. But now you can do it like a champ, and you love to play under your play mat and roll all over the place. You love playing on your play mat, and do a great job of playing with toys by yourself (as long as you know where we are). You're really close to being able to sit up on your own, but you'd really rather stand up (with assistance, of course). 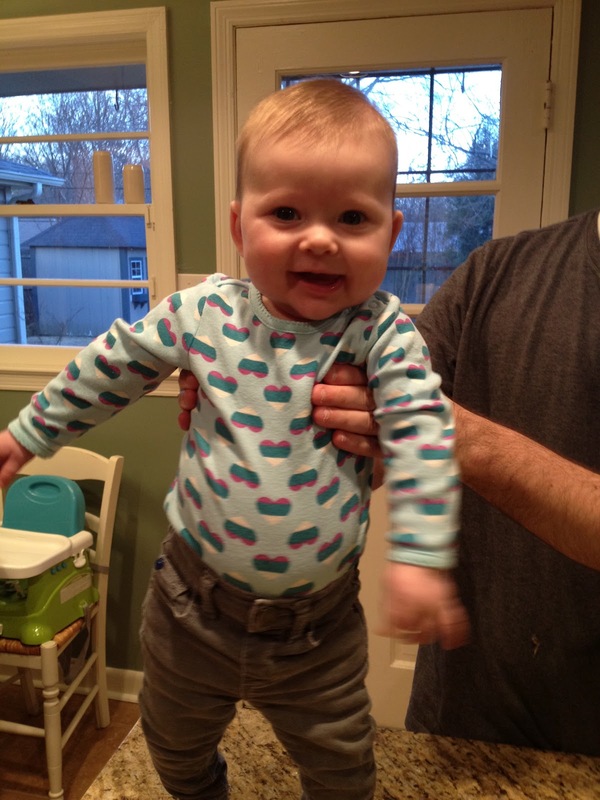 You eventually straighten your legs out when we try to practice sitting, in an effort to stand. Ha. I'm pretty sure you threw your first temper tantrum this month. Ha ha ha! I was trying to feed you some bananas or something, and you wanted to hold the spoon. I let you hold it for a minute and then tried to take it back to get another bite loaded on. You immediately started crying. It was hilarious. As soon as I gave the spoon back, you stopped. You haven't done that since, but it was so interesting to see you exert your little WILL. You were saying, GIMME. THAT. PHONE! You're one lucky little girl to have so many fun and wonderful people taking care of you during the week: Nana, Aunt Martha, Aunt Jamie, "Dede," "Aunt" Cindi, "Aunt" Jenny, and even Grammy a few times! You've been still staying home from day care this month...I know your teachers and your friends miss you! Does your hair even look a little blonde here? What in the world? Oh little precious, we just can't stand it how much we love you! We are so thankful that you are WELL and healthy and haven't had so much as one sniffle since we've been home! We love to take you for walks whenever possible (in this mild winter of ours)...you just chill out, are very quiet, and really enjoy being outside. You also love looking out the big window in our dining room, and are growing more and more interested in our kitty cat by the day. Sprouty, Little Sprout, Cute Baby, Drool-iette, Jewel Jule...we love you so much! We love watching you grow! As a mommy, this is the first month of Juliette's life when looking back at photos or thinking about her birth and it really doesn't seem like just last week. This new life of ours is growing some legs and becoming the Way Things Are. And I like it. I loved this post! [Clearly I like mommy blogs as I have one.] I think you'll like having this record of her growth. I know I look back at my blog to see what Sylvie was up to at different ages. I can't really remember what happened years ago without a little help. It's nice to have it recorded! 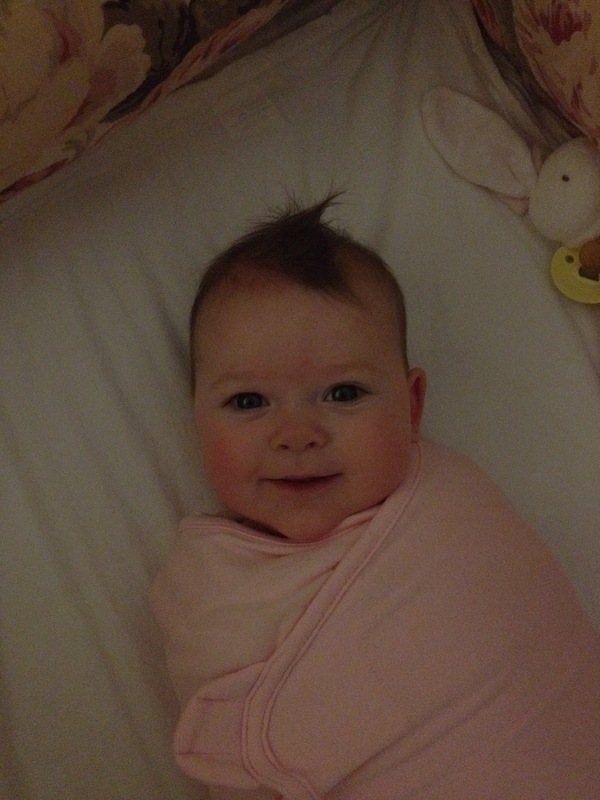 The pics are so great - what a happy baby! I especially love the one of her swaddled. What a doll! Evelyn and Juliette have so much in common - they eat the same rice cereal, play on the same play mat, and want to stand rather than sit! Oh, and they are both ridiculously precious. i love her so much. thank you for sharing her with us!